"Close 2 Shopping & More!" 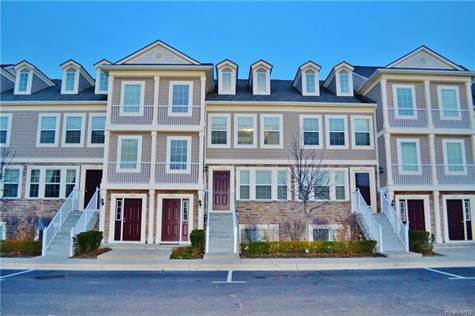 You will adore this newer 2 bedroom, 2 bath condo nestled in the rear of Rochester Commons with its private entryway, oversized balcony located off the dining area and the benefits of hassle-free living with full exterior maintenance. Enter and fall in love with the open floor plan, neutral paint colors and the spacious rooms. All appliances included with private laundry room located within unit. Ample amount of parking available including your very own 1 car attached garage with direct access. Common area conveniently located across from the unit for your enjoyment. Located within Troy Schools! Easy access to freeways, shopping and unlimited local eateries. Move in ready, featuring freshly cleaned carpets and available for immediate occupancy – Just in time for the New Year! 1.5 months security deposit, 1 month rent in advance. $295 non-refundable cleaning fee. Credit report required. Water is included in the rent!